The Multnomah Falls, just a half-hour drive east of Portland, is easily one of the ten most beautiful and breathtaking waterfalls in all of the United States, and also happens to be the tallest in the State of Oregon. The waterfall is probably only a little more than 20 feet wide, but plummets 620 feet, with this slender display giving it a sort of majestic, royal appearance. The Multnomah Falls are actually, in fact, two waterfalls, with the first dropping 542 feet, and the second going the rest of the way. But this fact only serves to make the falls an even greater experience, because a stone footbridge was placed over the falls in 1914, in between the first and second falls, giving you a richer, more immersive experience. You can get to the falls by taking I-84 out of Portland and getting off at either at exit 28, and following the Columbia River Gorge Scenic Highway, or save a little time and go right to the parking lot by taking exit 31. Once you’re at the parking spot, it’s only a short five minute walk to the Benson Bridge, in the middle of the falls, but you don’t have to stop there—although you should, for a bit. You can continue on the path, and take a relatively arduous 1.2 mile hike to the top of the falls, from which you’ll have an exquisite view of the countryside. Once there, you can continue your hike up Larch Mountain, or take a six mile loop to see the Wahkeena Falls. As one of the most stunning waterfalls in the country, it is fairly popular with tourists—especially during the summer months, so plan accordingly. 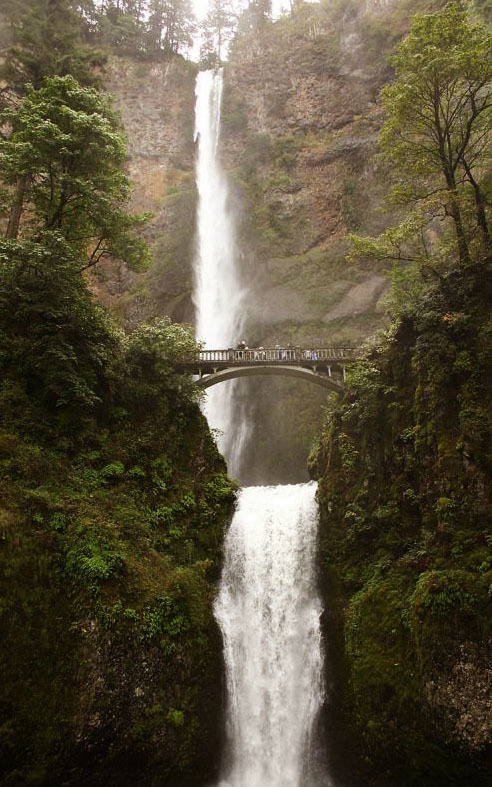 Unlike many waterfalls, the Multnomah keeps flowing year round (except for freezing in the wintertime—another gorgeous sight), and is absolutely spectacular amongst autumn leaves. No matter what time of year you go though, you’ll see some of the very best that nature has to offer. Consider stopping at the Multnomah Falls Lodge for a meal, open 8 am–9pm every day. They have a delicious selection of food, and you can see and hear the falls from the Lodge.